Christine Petrucci is the founder, director, and piano teacher at the Seacoast Academy of Music in North Hampton, NH. Get ready for a fun-filled music class! Professor Antonio Scontrino specializes in Digital and Film Photography and Graphics Technology at Central Connecticut State University. Professor Dario Del Puppo specializes in Language and Culture Studies at Trinity College, Hartford, CT.
Nina Dimascio is the founder of the Italian Culture Center of Education and Cuor d’Italia. She presented a Sicilian dish traditionally prepared during Carnevale. Her love for the Italian culture is brought forth in her love of cooking. Join Cuor d’Italia members in the culturally- and religiously-significant pastime and create your own personal set of rosary beads to take home with you! Participants had the chance to have beads blessed at the Saturday Night Banquet. Jason Scappaticci–Prof. of Student Development at Manchester CC. presented an oral and illustrated history of the Italian district of Hartford and the Riverfront. Enzo Boscarino, born in Italy and graduate of the Instituto G. Lombardo, from Radite, Catania, with a degree in Elementary Education, presented a musical tour of Italy with songs and humor. He has an extensive background in performances in the New England area. 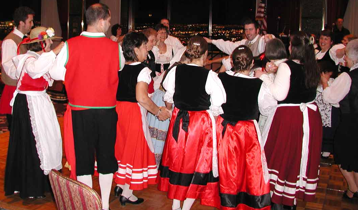 Saturday evening’s Festa Folcloristica Italiana included a banquet, folk entertainment, and music provided by the sensational New Skorpio Band, playing traditional and contemporary dance music.